Since 1969, Cherrybrook has been committed to offering all pet parents a complete line of quality products, from general pet supplies to specialty dog show supplies and dog grooming equipment. 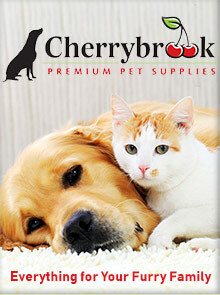 Use the Cherrybrook coupon code for the premium pet essentials that every pet deserves. Enter the Promotional Code - CATALOG10 - at checkout on the Cherrybrook website. Cherrybrook Dog Show Supplies - Cherrybrook provides professional show dog handlers with direct access to the premium dog show supplies, products and tools that help them present their dogs in a winning way. From professional show dog grooming equipment to chalks and powders, finishing sprays, coat enhancers, stain removers and dog snoods to keep your show dog's ears nice and clean, you'll always enjoy a winning selection from Cherrybrook. Dog Grooming Equipment - Whether your dog is competing or just hanging around the house, every dog deserves to look and feel their best. Cherrybrook brings you an extensive collection of specialty dog grooming equipment featuring the Chris Christensen line of products. Choose from professional dog grooming shears, shampoos, conditioners, clippers, dryers, combs, brushes, tables and other show dog grooming supplies that are top of the line. Cat Supplies - Cherrybrook makes sure that your canine friends are just as happy and cared for as your canine friends with a premium selection of cat supplies including state of the art cat litter boxes, comfy cat beds, entertaining toys, yummy cat treats, collars, furniture, cages and cat grooming products from fine brushes and combs to cat claw scissors, flea shampoos and more. Pet Supply Staples - From big items to little items, Cherrybrook supplies you with everything you need in order to keep your dog or cat happy and healthy, including a wide selection of collars and leads, pet beds, food, bowls and feeding supplies, pet treats, toys, dog crates, cat and dog grooming equipment, pet travel and safety products, health and wellness remedies, training equipment, books, DVDs and so much more. Dog Lover Gifts - If you're searching for hard to find breed-specific gifts, Cherrybrook has the distinction of showcasing a convenient Shop by Breed feature, where they list all of their Dog Lover Gifts available specifically by breed. Whether you're shopping for gifts for your dog, fellow dog owners or for yourself, Cherrybrook specializes in dog lover apparel, jewelry, bookends, auto magnets, dog art, collectibles, figurines, ornaments and more items featuring the breeds you love - from Akitas to Yorkies! Cherrybrook is one of the leading providers of premium show dog supplies in the United States, serving customers throughout the world. Besides their winning selection of dog show supplies and dog grooming equipment, Cherrybrook also offers thousands of new pet products that pet owners trust to provide long, healthy and happy lives for their pets.